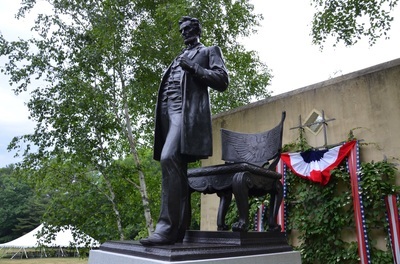 Consistent with the delays that Saint-Gaudens encountered for many of his works at the time of original production, the Standing Lincoln had been scheduled for dedication twice previously in 2015 only to have the date pushed back to June 26, 2016 for the centennial of the National Park Service. 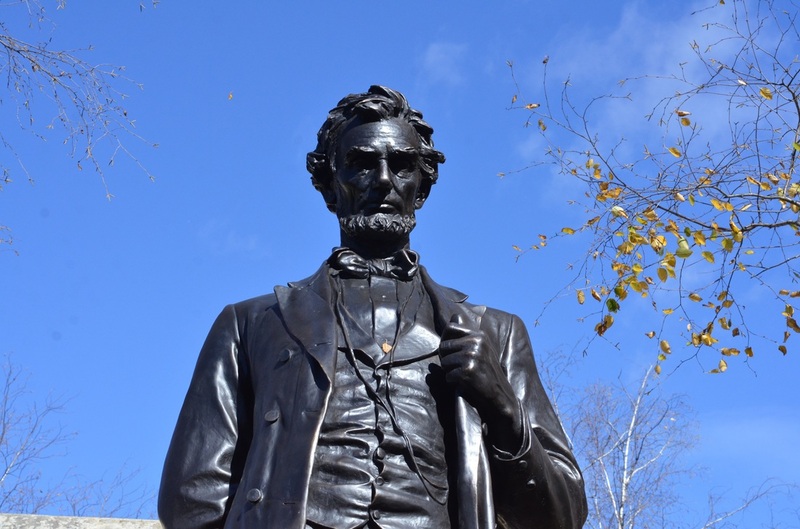 ​I have visited the ASGNHS dozens of times in the past and was present for the last monument dedication prior to the Standing Lincoln, which was the dedication of the Shaw Memorial bronze in 1997. Unlike the Shaw Memorial, which was not completely finished at the time of its unveiling, the Standing Lincoln bronze and base were finished and fully in place on the day of dedication. 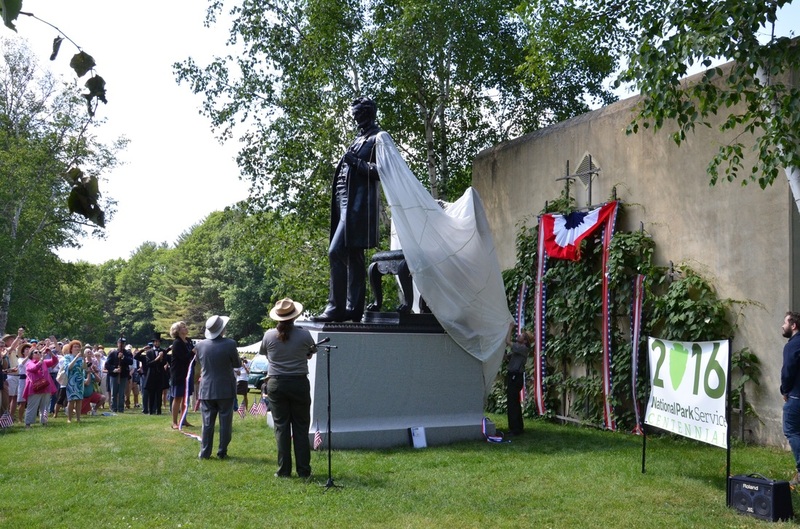 I arrived at ASGNHS for the unveiling and dedication of the Standing Lincoln monument the day before the event. 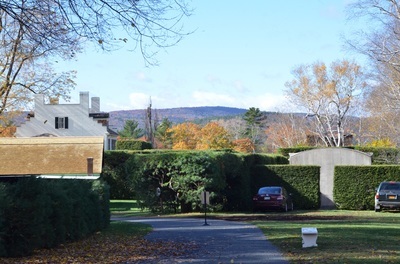 The ASGNHS is a wonderful park, but few folks ever attend and it is very easy to obtain a space in the 24-spot parking lot. Such was the case for the day before the unveiling. On a beautiful, sunny early summer day I got out of the car and essentially had this wonderful park to myself. 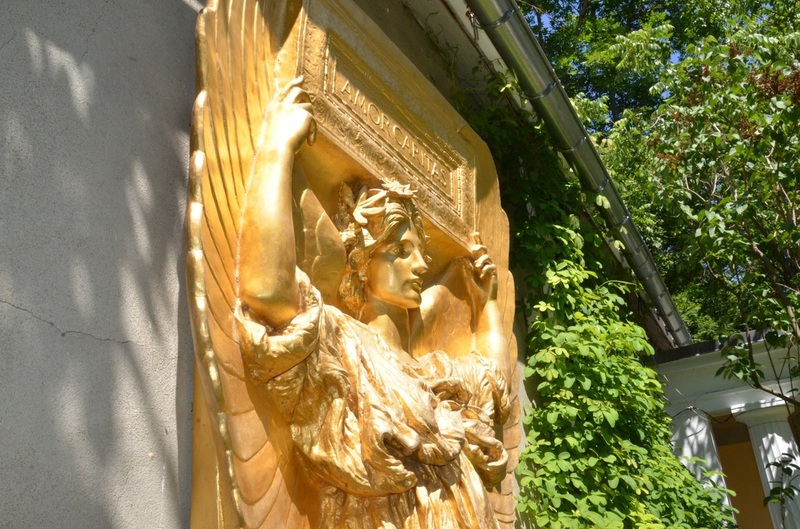 As always, I took images of various statues and architectural points and then spoke with the Park Rangers, whom I have become to know very well. The first few images are of Diana and the Robert Gould Shaw Memorial. The version of Diana that we are so familiar with is actually the second version of this iconic work as the first was lost in a major fire. 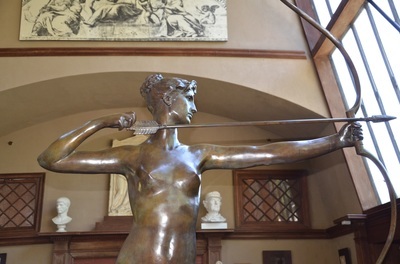 This version is slightly less tall and Saint-Gaudens made her thinner throughout. 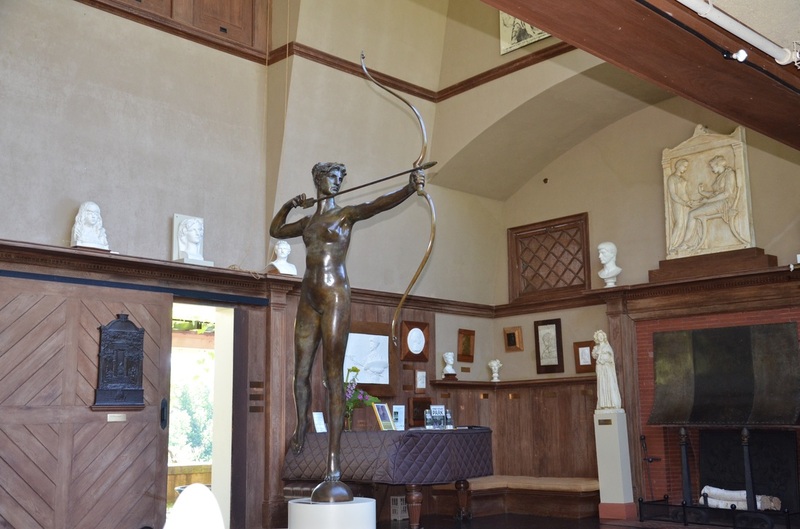 The two images of Diana were taken within the Little Studio and show additional works that are on display. I then walked over to the Shaw Memorial and took a number of shots of the work as it stands today. 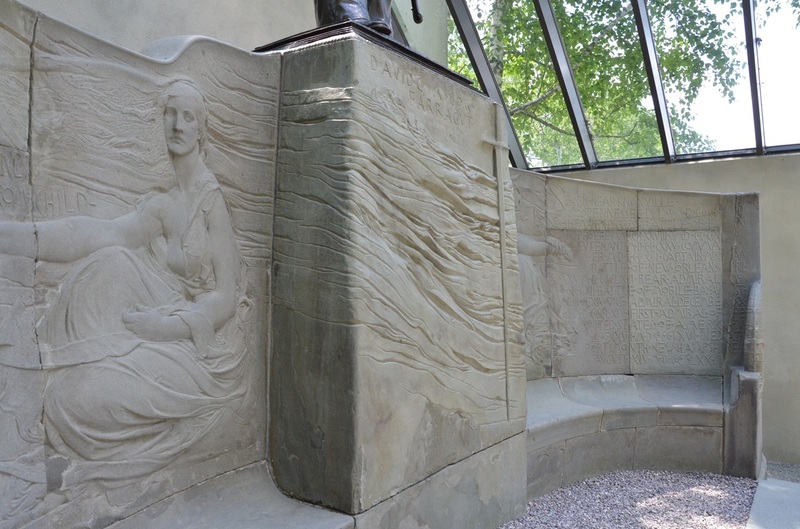 When it was unveiled in 1997 the work was not yet completed and the base was not finished, either. 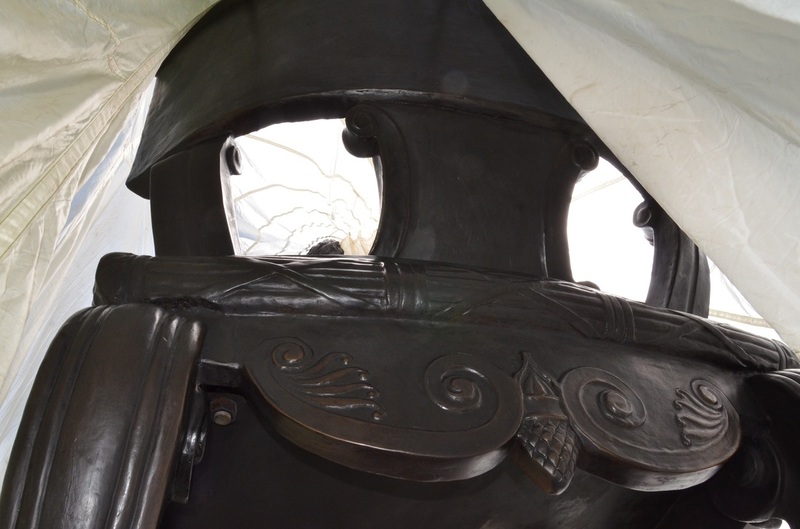 At that time there were wooden 2 x 4 beams holding the monument steady with nothing protecting the back of the work. Today, it is sturdy and the back is finished with concrete and bronze fasteners. 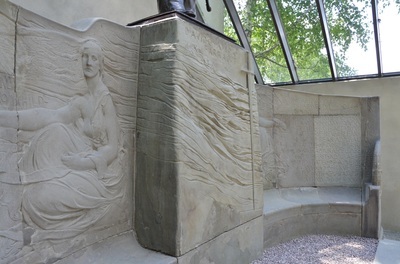 The first image shows the monument draped in front of the back of the glass-enclosed Farragut Memorial and open atrium that is home to Amor Caritas as well as a smaller studio filled with gems such as numismatic plasters, medals, plaquettes and patterns. 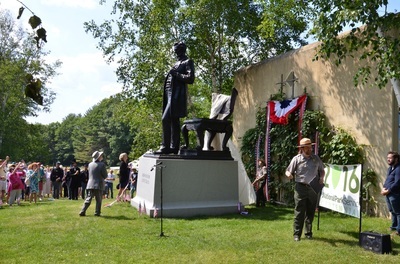 The next image again shows the glass-enclosed Farragut Memorial behind the Standing Lincoln, but also shows the tent that was set up to house the next day's festivities. The silhouette of Lincoln can be seen under the tarp in this second image. By coming to the park the day before the official unveiling, I was able to prepare a plan of attack for where I would like to stand to shoot images the next day. The viewing area directly in front of the monument was not large and there was a very small, roped off area marked "Press" that I felt did not get the best view. 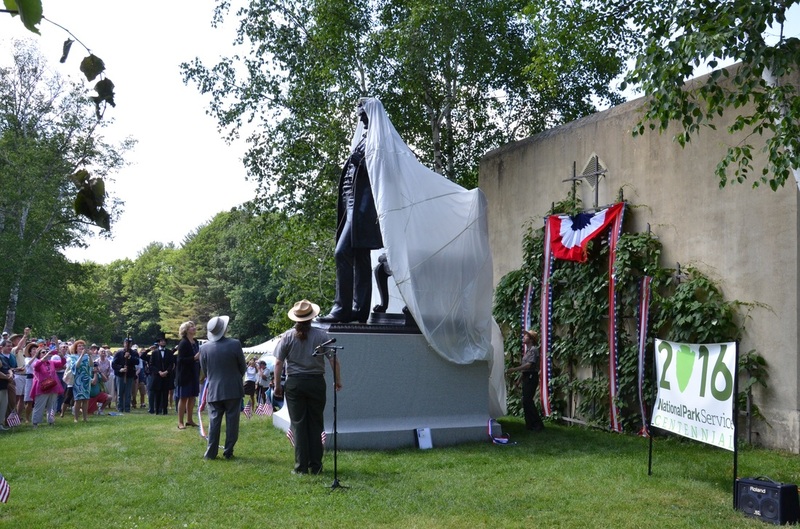 I chose to stand in a place where I could see Lincoln from the side, the Farragut Memorial to the back and right and the event tent to the rear and left. 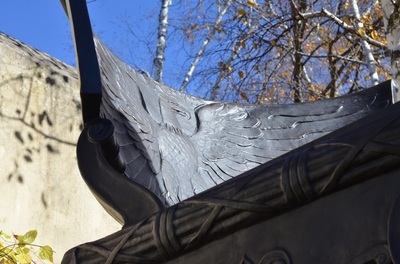 To the left of this second image is the Ranger's headquarters and gift shop. I asked the Park Ranger if I might approach the monument more closely and peak under the tarp to take additional images; she was fine with this and so I took a few images while Lincoln was still under wraps. 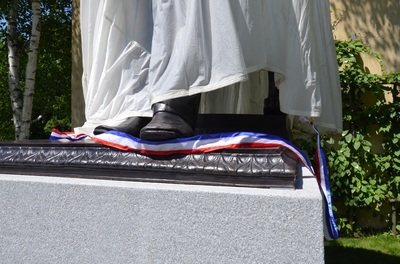 The above, from left to right, show Lincoln's feet coming out from the tarp with bunting, the name of Saint-Gaudens on the base of the bronze and the detail shown from the backside and underneath the chair that Lincoln stands in front of with the tarp falling over the bronze. As mentioned, directly behind the Standing Lincoln is a rich area of plaquettes, bronzes and other open-air works as well as a reflecting pool directly in front of Amor Caritas. I often venture into this area and it is quite peaceful and beautiful. 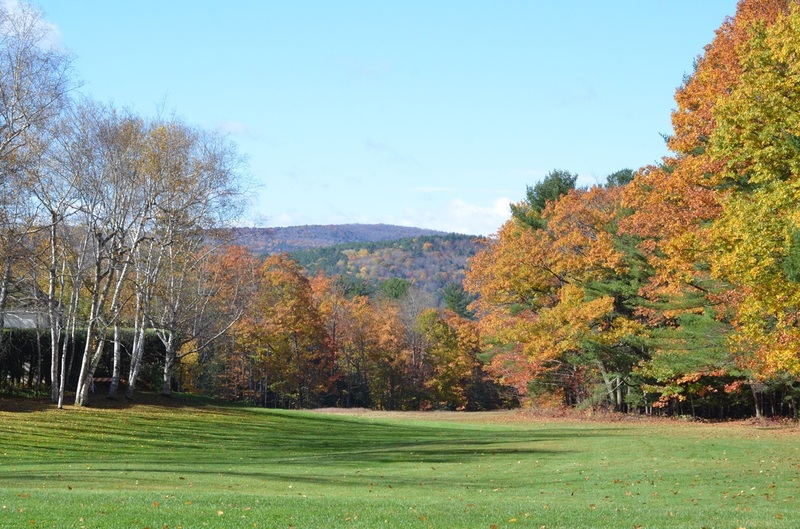 It also looks out toward Mount Ascutney in Vermont. I returned the next day for the unveiling ceremony and the park was filled with more folks than I have ever seen here previously. The Park Rangers estimated that there were in excess of 700 people attending the event. There were perhaps two full hours of speeches by state dignitaries including Maggie Hassan, the Governor of New Hampshire, followed by patriotic songs played by a band dressed in Union attire and the entire event was presided over by Steve Wood, a Lincoln impersonator. 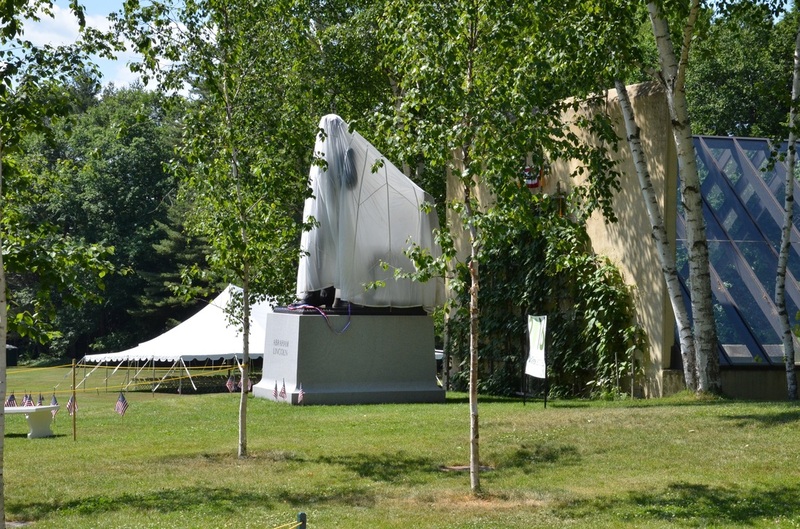 During this time I stayed away from the hot, still air of the tent and also away from the crowd gathered beneath the shade of the birch trees and instead visited the artwork and again spoke with the Park Rangers. 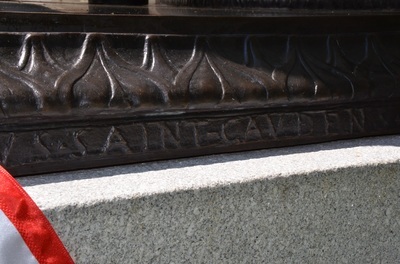 The Park Rangers were kind enough to tell me that the base of the bronze was produced from 43-tons of granite quarried in New Hampshire and finished in Vermont. 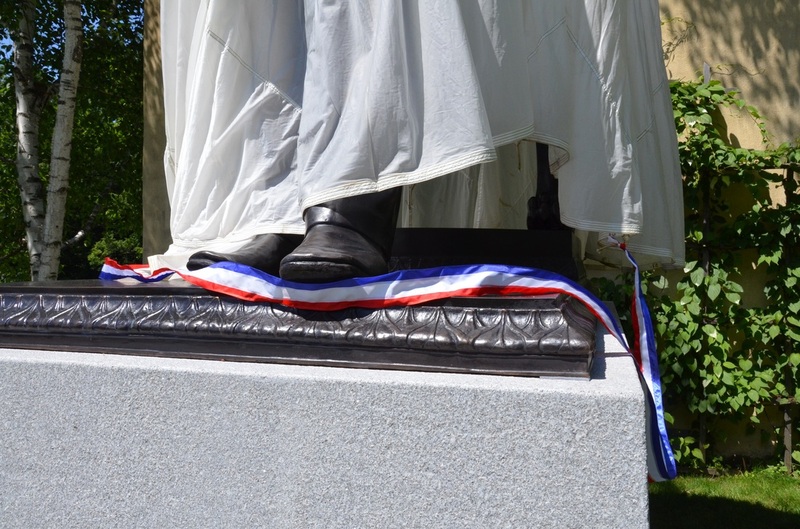 The statue itself had been trucked in from the casting facility while laying on its side on a flat-bed and had not been covered for the entire trip, which necessitated some clean-up work after it arrived at the ASGNHS. It then sat in its current position for several days while under the tarp and being pounded by heavy rains. 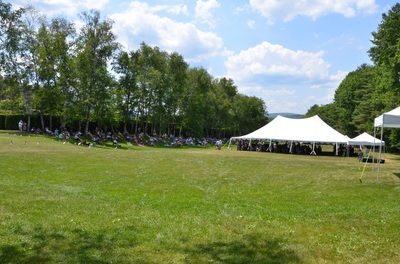 Above, left to right, Amor Caritas in direct sunlight; the event tent filled to overflow with additional people in the shade of the trees; and the original stone bench for the Farragut Memorial showing one of the figures, the long sword and much of the text. 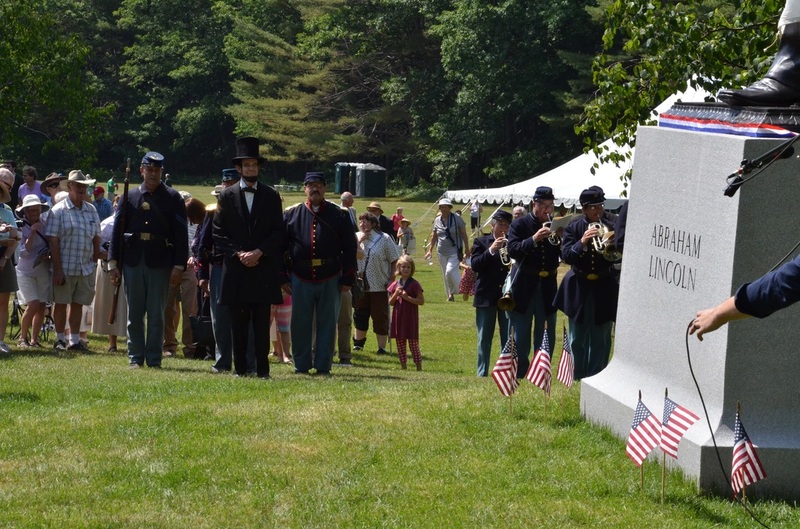 Once the speeches were finished, Lincoln himself led the procession up the shallow hill, accompanied by Union soldiers and a Union band. 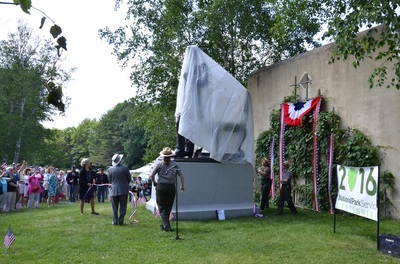 The next set of photos shows the mostly smooth unveiling of the Standing Lincoln to the applause of those in attendance. This series of images shows Lincoln emerging from the tarp as it is pulled off and is followed by a single shot of Lincoln standing tall amongst those who have come to witness the occasion. The crowds disbursed quickly as a new set of clouds rolled in and I returned the next day to see if there would be any spillover effect for attendance. Perhaps not surprisingly, the park was empty and I had the grounds to myself. Again, the Park Rangers were happy to discuss the memorial and they took me into the Rangers Headquarters to allow me to examine and photograph the life mask and right hand study of Abraham Lincoln produced by Leonard Volk in 1860. Bronze copies of these were produced by and twice presented to Saint-Gaudens; the first time while the monument was in its initial stages and then later after a fire destroyed them. 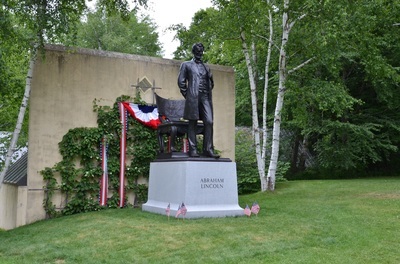 Below are a pair of shots of Lincoln after all the ceremonial seating and signage were removed and all that was left were a few flags in the ground, some bunting and the empty event tent in the background. 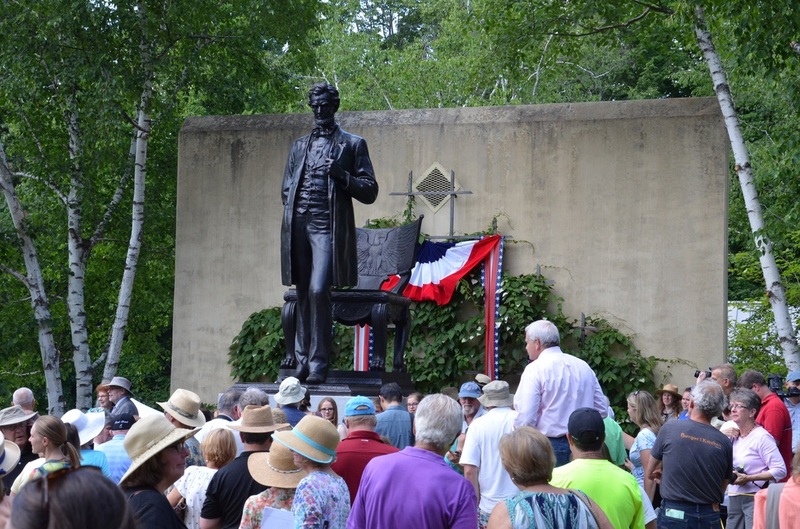 I decided to return four months later to see how Lincoln was doing and to visit the park again. 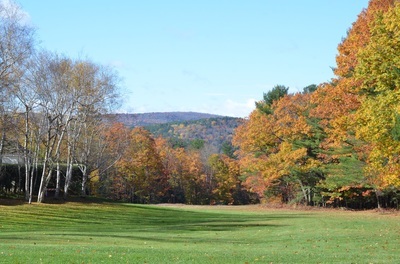 It was a very beautiful and chilly autumn day that had followed two days of high wind and heavy rains. Unfortunately, the wind and rains blew down quite a few colorful leaves, but the overall feel of the day was still one of crisp blue skies. 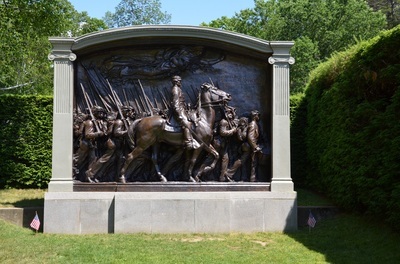 I approached the Standing Lincoln and again took shots of the monument with the glass-enclosed Farragut Memorial behind it as well as a shot toward Mount Ascutney in the west. 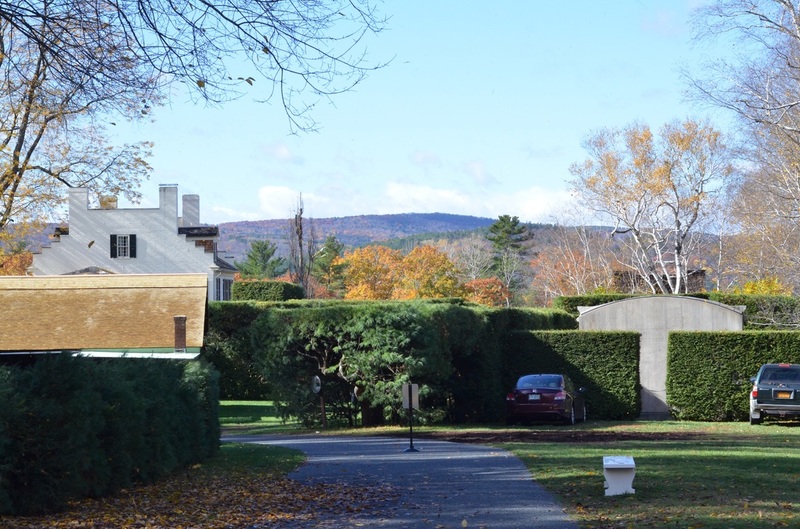 One can clearly see the painted white side of the Saint-Gaudens residence (Aspet) as well as the back of the Shaw Memorial with its curved top. 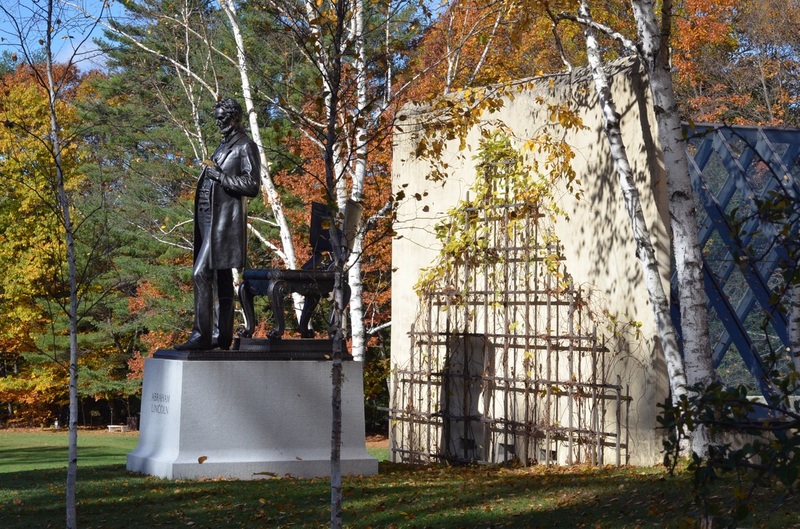 I finished this trip by walking directly up to the Standing Lincoln and took an image to show some of the detail in the chair, turned around to take a shot of the scenery across the lawn to the west and then, finally, one last image for the season of Lincoln towering over and gazing down at me with leaves falling all around and framed by a brilliant, blue sky. 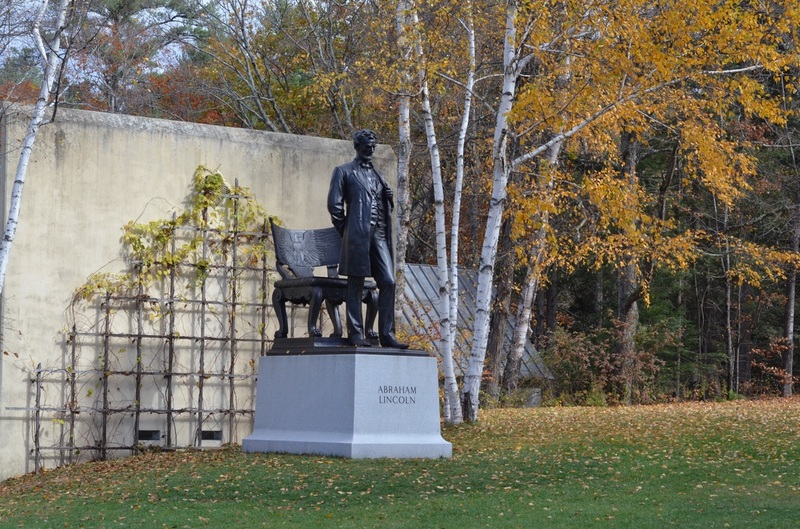 The National Park Service, https://www.nps.gov/saga/learn/news/Lincoln.htm accessed October 27, 2016. Saint-Gaudens, H., editor, The Reminiscences of Augustus Saint-Gaudens Volume I, 1913, The Century Company, New York, NY, p312. Image of Augustus Saint-Gaudens at work from the archives of the National Park Service. 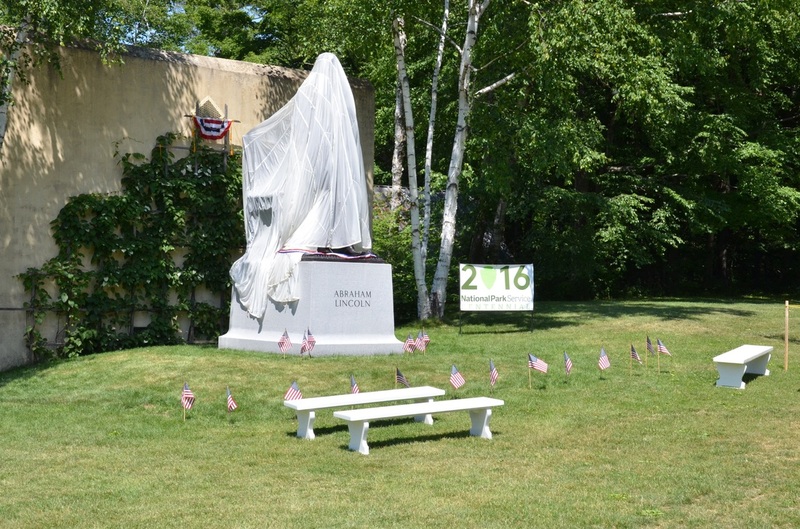 Osborne, N., "Lincoln Returns to Cornish", The Eagle Times, p1, June 27, 2016. 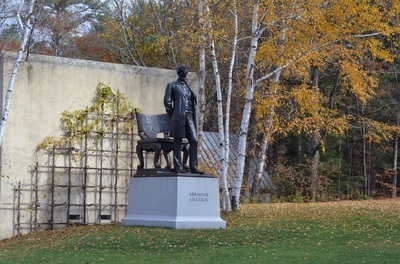 Abraham Lincoln Online, http://www.abrahamlincolnonline.org/lincoln/resource/masks.htm accessed October 27, 2016. ​ The Smithsonian National Museum of American History, http://americanhistory.si.edu/collections/search/object/nmah_1368279 accessed October 27, 2016.